Kristen Bell is my new hero. And it’s not just her charming rendition of “Love is an Open Door” as a Disney princess in Frozen (in duet with Santino Fontana). In an interview released last week, Bell acknowledged her long term efforts to manage anxiety and depression, including the effective use of medication since she was a teen. Bell is clear, composed, and very sharp in explaining how important it is to challenge the stigma that comes with mental illness. Coming out is a powerful way to do so, but it’s also risky. As an actor with a star profile, she commands high fees and is expected to carry big budget films. Producers wary about their investments can always think now about someone else. But acknowledging risk is part of coming out. In this way, she is just like those brave undocumented youth, gays and lesbians, and many others who challenge stigma head-on. Her celebrity and her candor makes it at least a little easier for the next person as well. Surely, there couldn’t be a much smaller share of mentally ill people in Hollywood than elsewhere in American life. Indeed, a growing tranche of journalism is devoted to documenting the crazy stuff tha t celebrities do. But more typically, that’s troublesome behavior: substance abuse, tantrums, and acting out–on and off set. You’d think those things would make it harder to get hired. Kristen Bell, deliberately or not, is part of a larger effort to destigmatize mental illness. 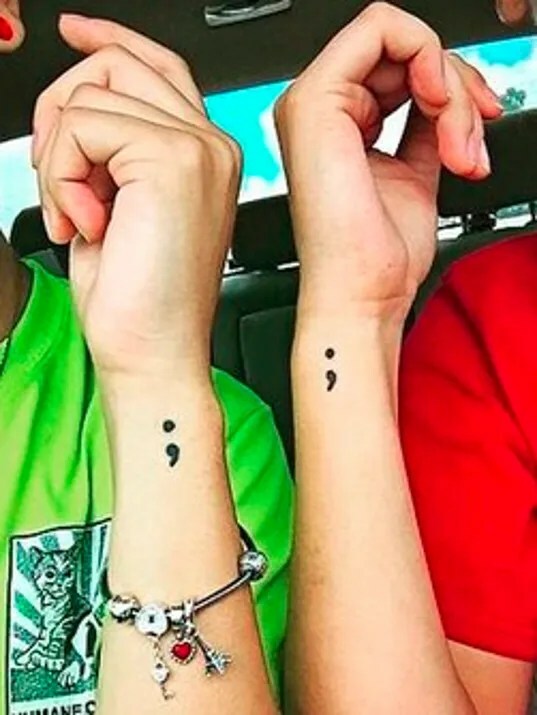 Less famous folks have taken on displaying a semicolon, often tattooed, to make the same point (comma underneath): that mental illness is more common and more treatable than we think. Organized by Project Semicolon, the idea is to show people struggling with mental illness that they are not alone–and to show the rest of the world that they need not be ashamed. I haven’t ever talked about this in public, but today’s a good day to start. I haven’t ever felt suicidal, but I do have Depression and Anxiety. I suffered for no good reason for decades, until I couldn’t reconcile my awesome life with feeling terrible all the time. Talking therapy wasn’t ever enough for me, and I was very resistant to medication, because I believed (and continue to believe) that we are an over-medicated culture. But, still, I wouldn’t just sit around and suffer if I had a treatable non-mental illness, so I went to a doctor, and I got better. Now, I take some medication every morning, and it has made all the difference in my life…. So, please, if you or someone you know suffer from Depression — with or without thoughts of suicide — please talk to someone, and get help from a doctor. As Jenny says, Depression lies, and you don’t need to let it control your life. Both Kristen Bell and Wil Wheaton are coming out to make it easier for others. But however much risk they took on in going public, one place even worse than Hollywood is high school. Two years ago, Madeline Halpert and Eva Rosenfeld, then students in Ann Arbor, Michigan, came out about their own struggles with depression and anxiety by publishing an op-ed in the New York Times. One girl, with a chance glance, noted that her friend was taking the same anti-depressant that she was. They started talking about just why no one talks about mental illness. Editors of their high school paper, they prepared a special issue filled with teens candidly coming out about mental illness. The school administration spiked the story, but the crusading editors found a somewhat broader audience with the Times. Again, the message was clear and smart and sharp and the messengers courageous. I haven’t heard them sing or watch them act, but I admire them even more than I do Kristen Bell and Wil Wheaton. If they’re all successful, one day it won’t take courage to come out. Is mental health awareness a movement? Battling stigma and exposing a problem is surely a start. But there’s also policy work to be done. Although federal law now compels health insurers to cover mental illness comparably to physical illness, no one even pretends that this is actually the case. And while the crusaders in this post had not only the conviction, but also the resources, to get effective treatment, many many people are left behind. Coming out, often the culmination of a long process for an individual, is the first step of a political movement. This entry was posted in Uncategorized and tagged Ann Arbor, coming out, Disney, Frozen, Kristen Bell, mental illness, Michigan, New York Times, op-ed, Santino Fontana, semicolon, social movement, Star Trek, stigma, tattoo, Wil Wheaton. Bookmark the permalink.